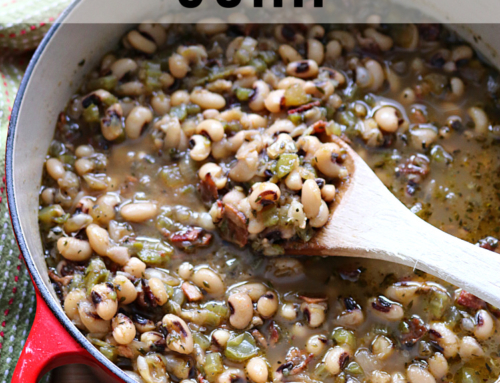 Crockpot pinto beans are the epitome of simple southern comfort food. 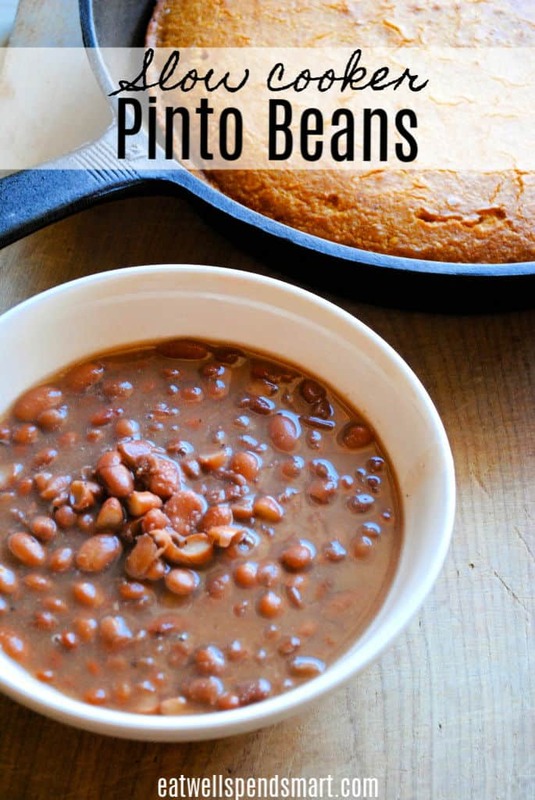 These simple pinto beans are made in the slow cooker so that they can simmer all day and get tender while you are free to do something else. The pinto beans, thanks to the magic of the crockpot, get tender and delicious while producing a creamy juice. They are just like Grandma used to make. 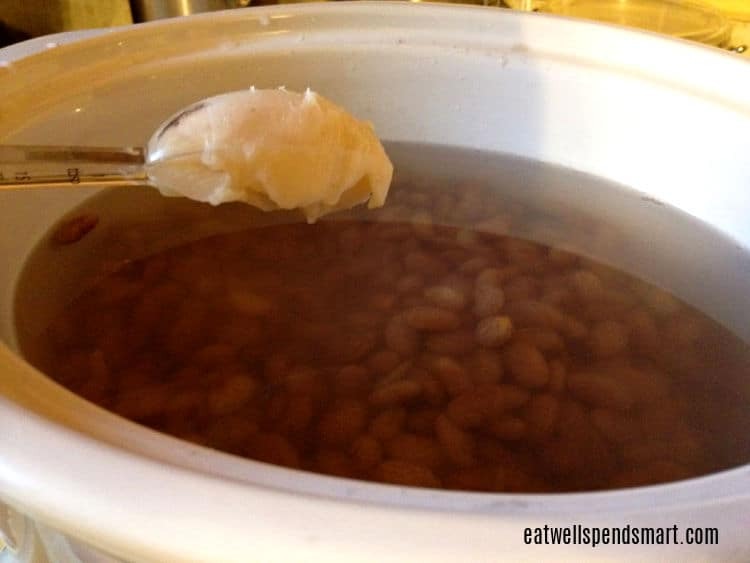 Follow my tips for perfect crockpot pinto beans. When I think of pinto beans, I think of my grandma. She is the queen of a comforting pot of simple beans. As a child, when we would visit, we would almost always be served a pot of beans at one point or another. That and chicken and dumplings have become her two signature dishes that all of us grandkids are now making in our own homes. Both make you wanna slap your pappy as my grandpa says. 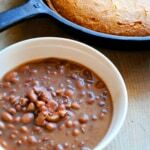 She often serves her pinto beans with greens and cornbread for a complete simple and frugal down home cookin’ country meal. Beans are so simple to make on the stove top, but I know many of you aren’t home during the day to babysit a pot of beans simmering on the stove for a couple of hours. 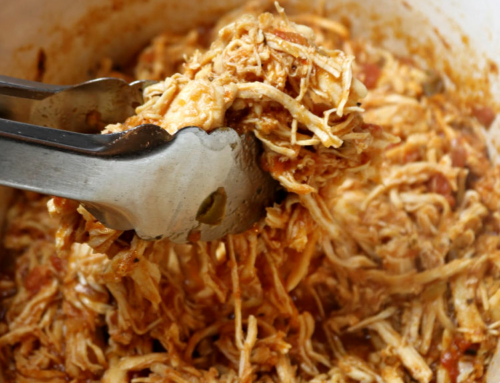 Using the crockpot is a great way to get dinner on the table if you work outside the home or are just busy with other things and can’t devote a lot of time to cooking. These crockpot pinto beans are seasoned very simply with just salt, pepper and a little bit of bacon, ham, or bacon fat. 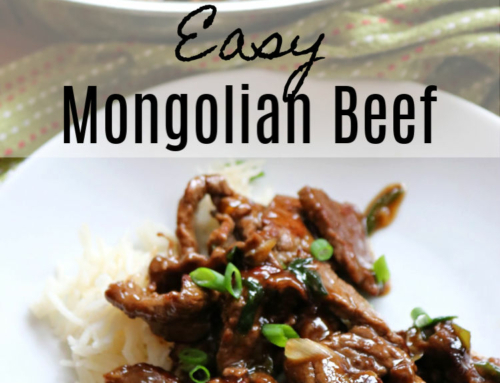 In my mind there is no need for fancy seasonings with this humble dish. The simplicity of the seasonings, makes the flavor of the bean shine through. I also like to keep the seasonings simple so leftover beans can be turned into different things. Beans are an excellent frugal protein source. 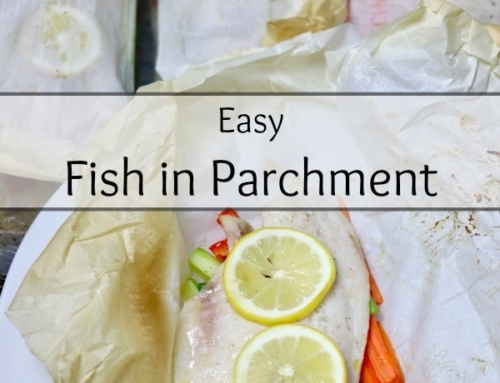 One of my favorite food budget tips after I have cooked them, is to reuse them in other recipes. Cook once, use in multiple dishes. They are excellent in burrito bowls or taco salads. Simply layer any ingredients that you desire: rice, beans, cheese, salsa, guacamole, corn, peppers, lettuce, sour cream. For re-fried beans, mash or puree the beans. You can add it to a toasted corn tortilla shell for tostadas, wrap them in wrap, serve it with eggs and salsa, etc. You can also use them in tacquitos, beans and greens soup, a bean dip or bean burritos. Do I have to soak my beans? No, when using the slow cooker you do not have to soak the pinto beans. Add more water though to account for the loss of soaking time. Do I have to use bacon fat or meat in my pinto beans? No, you can absolutely make these without either. They simply add that smoky pork flavor that is traditional in southern cooking. If you are vegetarian, add a bay leaf for more flavor. Mine aren’t thickening. How do I get that thick juice? The creamy thick juice simply comes from the starch in the beans. There is no need to add another thickening agent. Just cook your beans longer. They will also thicken more the longer they set. 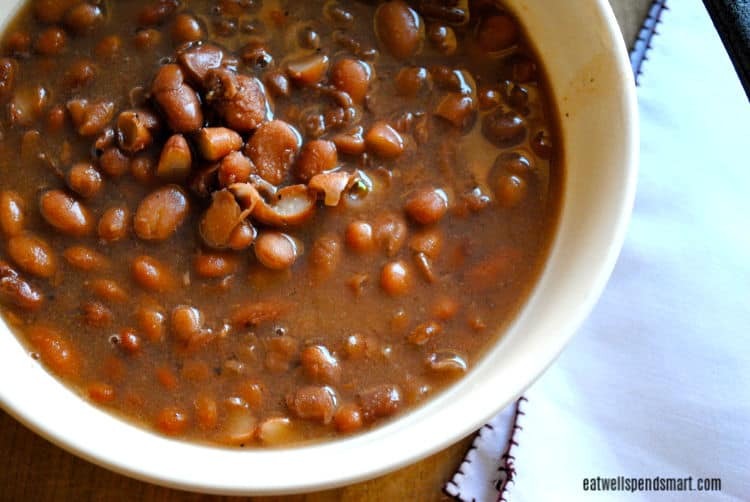 What sides go well with slow cooker pinto beans? Any southern side dish would be a great choice. My recommendations are boiled cabbage, collard greens, and cornbread. Yum! 1. Rinse and sort beans. Pick out any funky ones or debris. 2. 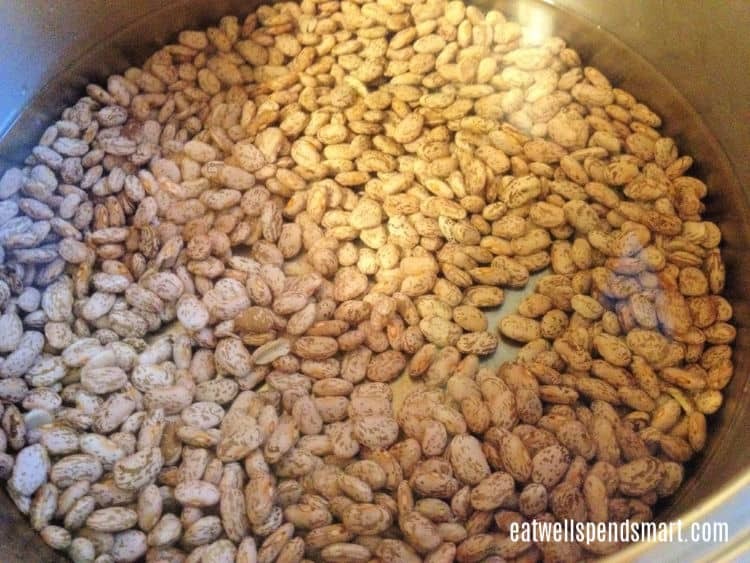 Optional step: Soak beans overnight with about 2 inches of warm water covering beans and a pinch of baking soda. If you are short on time, this isn’t a necessary step. Just rinse and put in slow cooker and proceed with cooking. Add another cup of water if you aren’t soaking the beans. 3. After soaking your beans they will look like the picture below. Drain soaked beans and place in slow cooker. 4. Add 6 cups water or broth, fat/bacon/ham hock (if using), and salt and pepper. 5. Stir beans and taste for salt preference. Add more if needed. Now gobble down those southern slow cooker beans! Simple southern pinto beans made easy in the slow cooker. Tender, creamy, and flavorful. 1/2 tsp pepper Use 1/4 tsp if you prefer less spice. 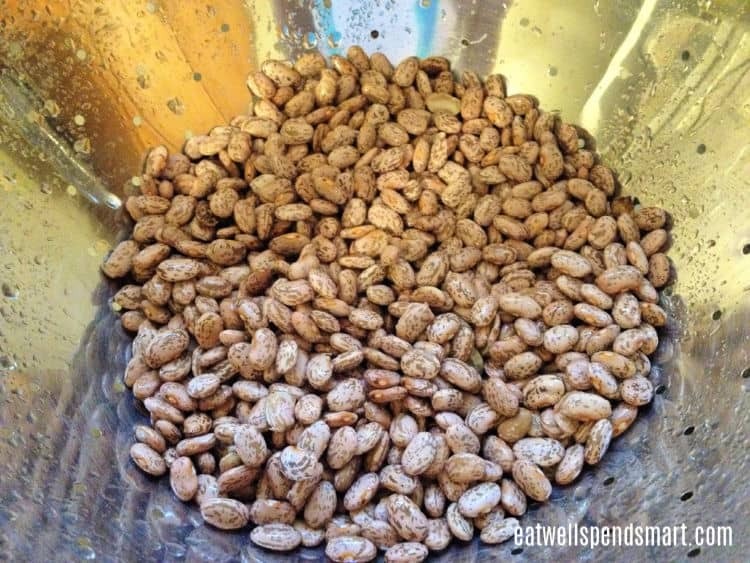 Rinse thoroughly and sort beans, removing any stones or beans that don't look good. Drain the next day and add beans to a slow cooker. Add 6 cups water, salt, pepper, and bacon fat, raw bacon, or ham hock. Use a bay leaf if you are vegetarian. Cook on low for 8 hours or on high for 5 hours. If beans are not tender, cover and cook longer. 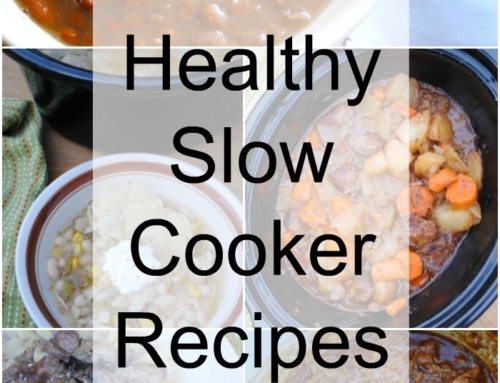 Depending on your slow cooker and age of the beans, it may take longer. Taste and add more salt to taste if needed. If you are short on time, you don't necessarily have to soak the beans ahead of time. You may have to cook the beans a little longer. Do you cook the bacon first before placing in the crock pot? No you do not have to. You certainly can cook it a little, but it’s not necessary. Do I soak the beans in the fridge? You can soak them on the counter. Chicken or vegetable broth would both work. Water is perfectly fine though. What’s on the spoon in the seconds to last picture? Bacon fat. If you don’t feel comfortable with that you can use a ham shank or a bay leaf if you want meatless. In my opinion, ham shanks are the way to go because they have a lot of meat. After the beans are cooked, take the shanks out and cut them up and return the meat to the pot. 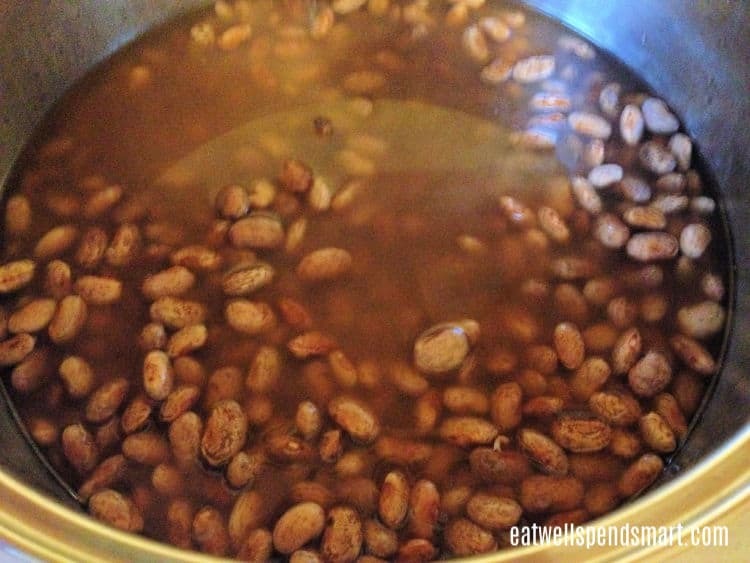 How much water for slower cooker 2 lbs pinto beans? Just double the recipe. You want enough water to cover the beans by an inch or so. Keep in mind the beans expand, so make sure your slow cooker can handle a large amount of beans. I only have a salt pork in fridge. can that be used? In the picture it shows you putting in butter but I don’t see butter listed as an ingredient in the recipe. That’s not butter, it’s bacon fat, as the instructions say. You can add it, use bacon or ham hock, or leave it out entirely. Bacon fat is the most flavorful way to go. Can you freeze cooked beans? Does cooking the pinto beans in the crock pot make the thick gravy? Yes, the thickness is just starchiness from the beans. If you cook the beans long enough and don’t overload it with water, they will thicken. I did exactly what this recipe calls for except the fat part and my beans still did not look like this picture….. what went wrong? What did they look and taste like? To keep the beans vegetarian but wanting a smoky flavor, add liquid smoke to the crock pot. I’m the only one in my family that is vegetarian, but everyone loves it when I use liquid smoke. When covering the beans with an inch of water, the juice does not thicken. I cooked the beans a lot longer on lower temps and still had water consistency. I really like the thickened juice/gravy with my cornbread. You mentioned the thicker juice is due to the starchiness from the beans. Can a little added starch help with this? I have no idea why it didn’t thicken. Mine always thickens so it might be an outside factor like our slow cookers cook differently or something different with our beans. It’s hard to say. You could make a slurry with flour, arrowroot, or cornstarch and thicken it if you would like. I cheat sometimes and use refried beans to thicken. If you think the beans are done and they are still watery, you can mash them just a little to get the thickness how you like it. Alternatively you could take out 1/2 to 1 cup and blend it and return it to the pot to thicken the liquid. If there is not time to soak overnight can you just cook them longer or is soaking overnight a necessity? I’ve done it plenty of times without soaking. You may have to cook a bit longer, but it will work. love these so much!!!! i add ham to mine! amazing and cheap. reminds me of grandmas beans!!! great with biscuits or cornbread yum yum!!! If they aren’t thick, just cook them longer. I find that sometimes I need to leave them in like 12 hours to properly thicken. Mine didn’t thicken and had a lot of liquid left, but I just scooped the beans out, placed in a dish, added the salt and just a bit of the cooking liquid and mashed with a potato masher a bit to make them creamy. Super good! Thanks for the recipe! so healthy and delicious. This will be perfect for the upcoming spring/summer months!